In Cape Town cricket is played against the backdrop of Table mountain, in Dharamsala the Himalayas watch over the sport, and in Corfu it's the Venetian New Fortress that guards the pitch. Yes, Corfu. That Greek island soaked in sunshine, decorated with olive groves and vineyards and accessorised with French and Italian architecture is now home to a real-life version of My Big Fat Greek Cricket Match. Matches, in the plural, in fact. In April the Hellenic Cricket Federation (HCF) invites schools from across the globe to compete in a multinational tournament to open their season. The HCF covers the teams' accommodation and breakfast and dinner, effectively leaving the parents with not much more than flight costs to bear. In September they close the summer with the Greek Cup, a competition in which people from the Greek diaspora play. Sandwiched between these two highlights is a thriving domestic season that includes 20 clubs, 13 of them in Corfu. Surprisingly to some, cricket owns a part of the island's history too. 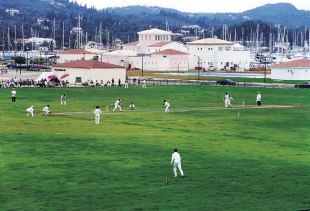 It has been played there since 1823, when a British Garrison and Royal Navy Team contested the first match on Corfu. Since then, English teams have often combined beach holidays with pre-season tours. Having observed the visitors over the years, the locals began to take an interest as well.